"I'm thrilled with the opportunity to work with a talented group," he said. "The immediate challenge will be to get the results we need to pull ourselves up the table. "But I'm aware that while I'm joining one of the great, traditional clubs of English football, it is one determined to go forward in the Premier League." Pardew, a former team-mate of West Brom technical director Nick Hammond, becomes Albion's sixth manager since 2011. John Carver, Pardew's former assistant at Newcastle, will join the backroom staff, with Gary Megson, who took temporary charge following Pulis' dismissal, leaving the club. West Brom chairman John Williams said: "We were impressed with what he had to say and what he has to offer and we are looking forward to an exciting new era under his charge." 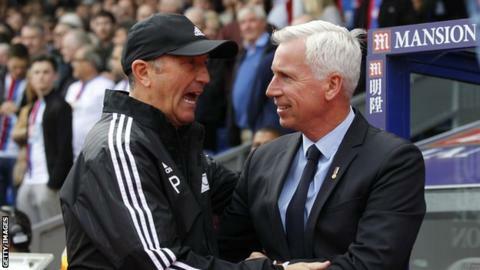 Pardew's first game will be against Palace in the league at the Hawthorns on Saturday, 2 December (15:00 GMT). Pardew, who has also had spells at Reading, West Ham, Charlton and Southampton in an 18-year managerial career, lost the FA Cup final twice as a manager. He was named League Managers' Association Manager of the Year in 2012 after Newcastle finished fifth place in the Premier League. However, he has also been involved in various controversies during his career. While West Ham boss in 2006, Pardew was involved in a confrontation with Arsenal manager Arsene Wenger, and in January 2014, he swore at Manchester City boss Manuel Pellegrini while at Newcastle. Two months after that, he was fined £100,000 and given a formal warning for headbutting Hull City midfielder David Meyler.